It was a dolphin show that one young Illinois girl will never forget. Kristi Flury, 12, and her mother, April, took a trip to the Brookfield Zoo to see the Dolphins in Action show on Thursday afternoon. When they got to the zoo, Kristi was under the belief that her father, Captain Joshua Flury of the United States Army Reserves, was still in Kuwait on his second deployment. Little did she know, he was backstage, awaiting his cue. April contacted the zoo back in June to plan the homecoming surprise for her daughter. Joshua has been in Kuwait for 10 months as a projects officer and was able to come home a few weeks early to spend time with Kristi before she goes back to school. The zoo had cameras rolling during the surprise, and shared the heartwarming moment on Twitter. 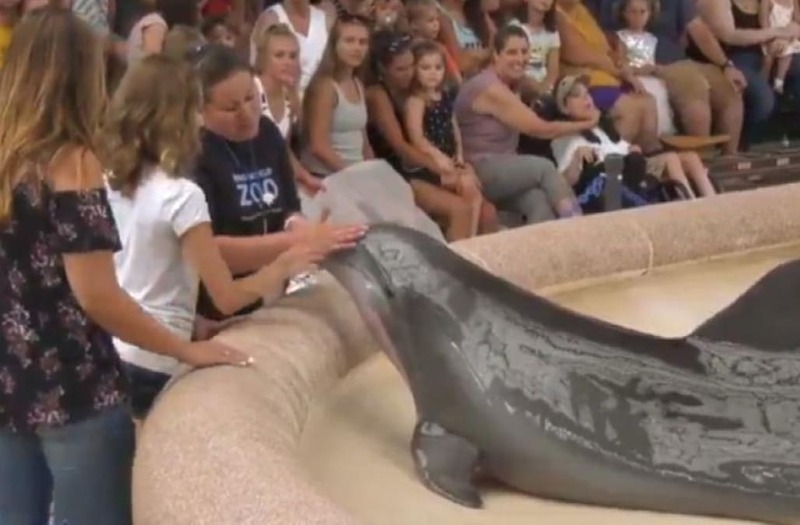 During the show, Kristi and April were called up and given the opportunity to pet one of the dolphins in front of the audience. The instructor later announced that she had a surprise for the girl, and welcomed in Joshua. When Kristi spotted her father, she ran to him and leapt into his arms. The crowd gave the family a standing ovation and greeted the captain on their way out of the show.